CreateSpace has been designed from the outset to meet the needs of self publishing or indie authors including Print-On-Demand (POD) capability. Therefore, its interface to authors is easy to understand and relatively intuitive and their customer support is good. It is possible to publish a book on CreateSpace at very low or no cost. However, along the way you will have the option if needed to take advantage of the many services they provide. Keep in mind however that these services are one way in which CreateSpace supplements their earnings. Often it may be possible to obtain these additional services with better quality and lower costs elsewhere online. Perhaps the greatest advantage of using CreateSpace is that it is owned by Amazon.com, which sells 64% of all printed books sold online. This relationship makes it extremely simple and quick to get your cookbook available for sale to millions of customers on Amazon with very attractive royalties. Often books from CreateSpace are accused of being given "preferential treatment" by the huge bookseller. We know that in our case Amazon sometimes obtains quantities of our books ahead of actually receiving purchases so that they can maintain the "In Stock" designation and 2-day Prime turnaround on our best-selling books. This is done at no extra cost or risk to us and is unlikely to happen if our books were not from CreateSpace. CreateSpace has two distribution channels. The primary one is through Amazon.com and Amazon Europe. Amazon is the largest online bookseller and will make your book available to a huge audience who are ready to purchase. Selling books on Amazon is typically the highest priority for most self publishing authors. However, if you would like to sell your books to other booksellers, schools, and libraries throughout the US and beyond you need to use the Expanded Distribution channel. As strange as it sounds, CreateSpace uses its strongest competitor, Ingram's Lightning Source, to distribute to channels outside of the Amazon umbrella. This will allow you to broaden the distribution of your book, but unfortunately it has one large drawback - CreateSpace deducts 60% of your book's list price, in addition to the printing cost, before paying you a royalty. This greatly reduces the profits you can make through the Expanded Distribution channel. As an example we sold approximately 10% of our books through the Expanded Distribution channel in 2014. But this accounted for only 6% of our royalties because of the higher discount in this channel. One of the best ways to discover the various costs and potential revenue a book could produce is to go on to the CreateSpace site and enter the parameters of your planned book into their Royalty Calculator. If you are interested you can also explore royalties further. For comparison, here are two sample cookbooks that are essentially identical except that one is in black and white and the other in color. A similar table is available on the IngramSpark review for your comparison of the two publishers. From these samples you can see that there is no setup cost associated with CreateSpace. There are also no change fees or yearly fees required. Even one of the ISBN options allows you to use their free ISBN number. Although we do not recommend that choice. Notice there is a significant difference in the price between the B&W book at $3.25 versus the color book at $14.85. 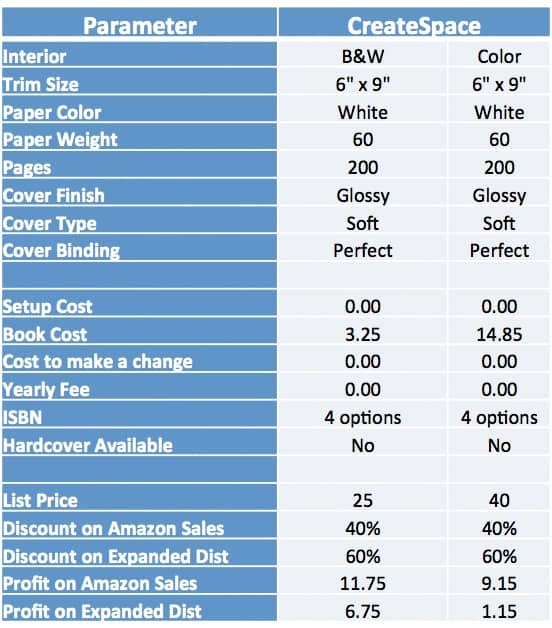 This results in a much lower profit per book even though the list price of the color book was increased by 60%. The other important take away from this table is that you can see there is a huge difference in the profit you will receive from books sold directly through Amazon versus those sold through the Expanded Distribution channel. CreateSpace is arguably the lowest cost mainstream self publishing solution available. This is done in part with no setup fees, no change fees, no yearly fees, and free ISBN. Also, the cost of the books themselves are relatively low, which helps when purchasing books for reviewers, contests or when selling to a wholesaler. CreateSpace may have the edge when it comes to ease of use amongst the major self publishing companies. They provides two methods for entering information on a new book. The "Guided" method which is a step-by-step process with directions available throughout. Once you're familiar with the process you can opt for the "Expert" method which is a single page containing the information you need to enter. You can see a detailed step-by-step walkthrough of publishing with CreateSpace. They have a fairly unique customer service approach which allows you to either email them or have them call you and address your issue. We have used them both and they work quite effectively. Most books are for sale on Amazon within 1 to 2 weeks from submittal, and often as fast as 2 to 3 days. You have the option to change the list price of your book for things such as promotions or price sensitivity testing. They handle everything including printing, selling, shipping, and returns. This can be a huge benefit to self published authors who would rather be focusing their time on creating books instead of the logistics of getting them to their readers. It doesn't get any simpler than this - you just wake up every morning, go online, and see how much you made in royalties the day before. All books from CreateSpace are available for Prime and Super Saver shipping which makes your book more inviting in this era of instant gratification. Shipping to US customers is fast and relatively inexpensive. If you have your heart set on a hardcover book you'll have to find another publisher. This seems like a huge hole in their product line and we can't quite understand why they don't offer it. The relationship of CreateSpace and Amazon is a huge positive as mentioned above for a variety of reasons. However, if you hope to sell your books outside of the Amazon umbrella, such as in brick and mortar bookstores, CreateSpace is not the way to go. There are numerous reasons for this. All sales of your book outside of Amazon need to flow through the Expanded Distribution channel. And although bookstores can buy your books through this channel it's unlikely that they will since they don't want to buy books from their major competitor. Also, since there is no return policy most bookstores will not carry your book. If someone comes to a bookstore and special orders it, most stores will get it for their customer, but is unlikely that any will carry it in stock. And as mentioned above, the heavy discounting required in the Expanded Distribution channel makes it much less appealing as well. If the quality of your book is your highest priority it is unlikely that CreateSpace will measure up to your expectations. From what we have read and experienced personally the quality of the books from CreateSpace fluctuate more than some would prefer. Specifically, in our case we have seen the pictures in different printings of the same book vary widely in their quality. At one point we have also received books that were cut to the wrong trim size - twice. Interestingly we have seen very few books returned and the quality of the books is rarely mentioned in the Amazon reviews. So it appears that in general we are meeting the expectations of our readers. Because of the simplicity and higher royalties many people publish on Amazon through CreateSpace. Conversely, because the royalties through the Expanded Distribution channel are low, many authors will use IngramSpark to reach the outside channels.